When patients contemplate IVF, their first reaction is often the fear of daily injections of hormones for months, the incredibly high cost of the drugs, the risk of multiple pregnancy and consequent prematurity, side effects related to high levels of estrogen resulting from large numbers of eggs, hyperstimulation syndrome, and the prospect of painful daily progesterone injections for a full ten weeks even after the IVF procedure. Mini-IVF is a very unique approach developed by our colleagues in Japan to circumvent these problems in certain types of patients and reduce the cost while trying to maintain comparable success rates. We do not advocate this for all patients, but for many, it is worth trying. Mini-IVF [see video] is designed to recruit only a few (but high quality) eggs, thus avoiding the risks of hyperstimulation, reducing the cost of drugs from an average of $4,000 to closer to $400, reducing the number of injections, and completely avoiding the painful progesterone injections. This approach is not just a simple-minded reduction in hormonal stimulation. It is an ingeniously conceived and completely different approach to IVF, that saves the patient much of the complexity and cost associated with more conventional IVF protocols. Here is how it works. On Day 3 of the menstrual cycle, you start on a low dose of Clomid (50mgs), but you do not stop the Clomid in five days, as is usually the custom. You just keep taking the Clomid until ultrasound monitoring shows the follicles to be ready for ovulation. A very low “booster” dose of gonadotropin (just 150iu of FSH) is added on days 8, 10, and 12. Clomid not only stimulates your own pituitary to release FSH naturally(by blocking estrogen’s suppressing effect), but by continuing the Clomid (a unique new approach), it blocks estrogen’s stimulation of LH release, and thereby blunts premature ovulation. Thus, with this simple change in protocol, old-fashioned, inexpensive Clomid is able to stimulate the development of great quality eggs for IVF. Another advantage of this protocol is that you do not have to go on Lupron first to suppress the pituitary. Staying on Clomid blocks estrogen from stimulating your pituitary to release LH, and then retards premature ovulation without your having to be suppressed. This means that you can be induced to ovulate with just a simple injection or nasal sniff of Lupron. This causes a more natural LH surge and avoids the luteal phase defect caused by HCG that would otherwise require months of progesterone injections. The next step is to recognize that Clomid has a negative effect on the uterine lining (because it prevents estrogen from stimulating the endometrium). That is one reason why results in the past have been so poor with the use of Clomid for ovarian stimulation. The embryos are less likely to implant in such endometrium. But that problem is solved by using the Japanese protocol for embryo freezing, “vitrification,” which I have discussed already. We can now freeze the embryos almost with impunity using this approach, with only a 1% risk of loss. Then these embryos are transferred the next month in a “natural cycle” with no need for taking any hormones at all. Even if you do not naturally ovulate predictably, you can be given one injection of Lupron in the follicular phase (once your follicle reaches 1.5cm) to induce natural luteinization and still have a natural cycle embryo transfer with no hormones. The Day 3 frozen embryo would then be transferred five days later, and there is no need for taking any hormones at all. Even for poor prognosis cases of older women with low remaining ovarian reserve, there is an advantage to mini-IVF over high dose stimulation. Such patients normally yield very few eggs anyway even with huge megadoses of gonadotropin. If they have any quality eggs remaining, mini-IVF is just as likely to yield as many eggs (very few, of course) as giving huge megadoses of gonadotropin. Even in the worstcase scenario, if there are no good eggs left at all, at least patients can discover this with less money spent on drugs. Think of this simple parable: If you are sitting under an apple tree, and wish to eat the most ripe and ready apples, you have a choice. You can chop down the entire tree and look at every apple on the fallen tree to see which ones are ready, or you can simply try to shake the lower branches and eat the one or two that were ready to fall. That is the idea of mini-IVF. 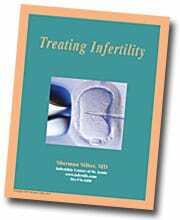 It may not be appropriate for all patients, but for many, it will remove some of the aggravation and complexity associated with IVF, and also reduce the cost.